Proof of a Concord Kept is a Multiplayer Item in Dark Souls 3. Distinguished proof that one has hunted the enemies of the gods, as per the ancient accord with the Way of Blue. 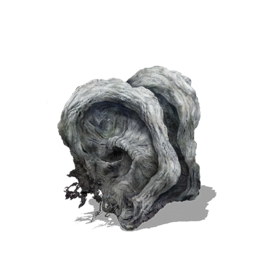 The layered ear of a dark spirit is the mark of a particularly guilty offender, one who has flagrantly violated one god or another. Use to acquire two Proofs of a Concord Kept. Blades of the Darkmoon tribute item, used to increase rank in the Covenant. Aquired from being summoned as a Blade of the Darkmoon and killing a red dark spirit that is in the Aldrich Faithful Covenant. Using this item gives you two Proof of a Concord Kept items. This item only drops from Aldrich Faithful invaders that use a red eye orb to invade. It doesn't drop from the blue and red colored phantoms. It is a 100% drop from Rosaria's Fingers invaders that use a red eye orb. Faithfuls/Watchdogs who drop this only drop it because they have sinned (killed an NPC) jesus...dullards. I have many of these. The way i obtain them is by killing 3 any kind of invaders. When three are dead they say duty fullfilled and award you one. Hard to obtain because most times theres only one or two to kill. But if you get lucky enough you can also get one as the guide says. Way i do it is to head to pontiff sulyvahn bonfire with no ember. Head out to main area and wait. And dont lose of course. Im KiLLjoY-42481 on ps4 if ya wanna see. Happy gaming. just blame fromsoftwere. this thing is so hard to proof. who knew who is worng. The fextralife article is CORRECT. Any comments claiming that this drops from Rosaria&apos;s Reds or sinners are INCORRECT. Only Rosaria Fingers drop this. FAITHFUL spirits such as Aldrich or Farron Watchdogs WILL NEVER drop ANY proof. If you got one it was because somewhere else dark spirit died. Absolutely none of the information for this item is accurate. I am inclined to believe that you get these from being summoned as a Blade of the Darkmoon and killing a dark spirit that has sinned, meaning they killed a friendly NPC in their game. i know how to get them. always when i was called by the darkmoon blade covenant (it happens almost never) i get them by killing an aldrich faithful. so u need to be called to kill an aldrich faithfull. Wondering if I was to farm this Item with one of my high luck characters, and then wanted to give them to my brother&apos;s character (leaving them when he summons me) does that work? we are trying to get the all mircales trophies. I need some help with the Darkmoon Covenant, really frustrating having to either wait for the item to be dropped, or be summoned (which happens almost never).